Fruit structure is diverse within Gesneriaceae and significant both in ecological and taxonomical respects. The traditional classification of the gesneriaceous fruits into “capsules” and “berries” is better replaced by “dehiscent” (opening) and “indehiscent fruits” (remaining closed), as the gesneriaceous berries often do not conform with the type which is commonly associated with that term. Dry capsular fruits are found in all major groups and there is little doubt that they represent the more primitive type. Capsular fruits of Old World Gesneriaceae. Dry capsular fruits prevail by far in the paleotropical Gesneriaceae. In many Didymocarpoid Gesneriaceae (Didymocarpoideae) the capsule is elongated and pod-like (in some species of Aeschynanthus and Agalmyla more than 40 cm long). Dehiscence is mostly by longitudinal slits, so that the fruit opens with valves, either two lateral, two median or both. In Schizoboea, Lysionotus and others the fruit regularly disintegrates into six parts: four valves and the sclerified lateral bundles. In Tetraphyllum the sclerified bundles remain united at the style base, while the four valves are shed. In the tardily dehiscent fruits of Didissandra the valves break into lamellae along the sclerified lateral and parietal bundles. Regarding seed dispersal, these simple capsular fruits are usually unspecialized; the seeds are shaken out by wind, rain or passing animals or simply fall to the ground. In Aeschynanthus, most species have hairs attached to one or both sides of each seed. These hairs, which can be very long, serve to facilitate wind-aided distribution of the seeds (see Appendaged Seeds below). 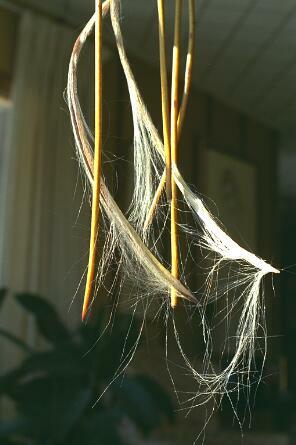 Twisted seed pods of Damrongia orientalis. In a number of genera (Damrongia, Streptocarpus, Boea, Paraboea p.p., Trisepalum, Ornithoboea, Senyumia, Spelaeanthus) the fruits are twisted, the two valves being helically wound. Twisting does not take place in the ripe, dry condition, but results from a special mode of growth starting after anthesis. The ecological significance seems to lie in the fact that seed release is retarded and prolonged. Dispersal is by wind or water. Another characteristic type is the “follicular” fruit, in which dehiscence takes place in the upper carpel only (along the median carpel bundle). This (usually long) fruit is held ± horizontally, making an angle with the pedicel. In Codonoboea this is achieved by unequal growth of the receptacle, in Loxocarpus mostly by unequal growth of the carpel base. This type of fruit is found in plants of ever-wet rain forests, and represents a special form of a rain-wash or rain-splash capsule: when the fruit opens dorsally, the seeds lie exposed and are washed away by the rain. 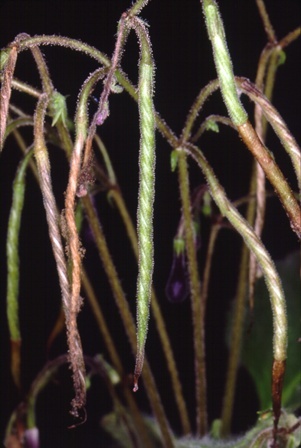 Examples are Ridleyandra, Henckelia, Codonoboea, Paraboea p.p., Loxocarpus, and most straight-fruited species of Streptocarpus in the wide sense of Nishii et al. (2015). By progressive shortening of the fruit, Loxocarpus incanus and allies approach a typical bowl-shaped rain-splash cup. Short, ovoid or globose capsules open in the ways described or by a circumscissile line (Epithema: a perfect rain-splash cup embedded in a funnel-shaped calyx), or the upper part of the fruit wall breaks irregularly into pieces (Loxonia burttiana). Epithema saxatile seed/flower head, with multiple splash cups and exposed seed. 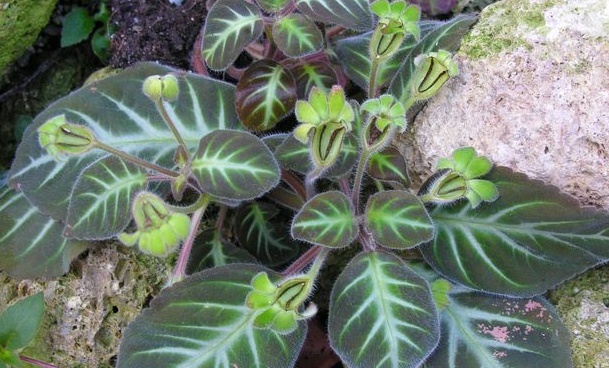 In the Coronantheroid and Gesnerioid Gesneriaceae (Geserioideae-Coronanthereae, -Beslerieae, -Napeantheae and Gesnerieae) there are fewer genera with dry capsular fruits. The dry capsular fruits of Gloxinieae (Gesnerieae-Gloxiniinae), Sinningieae (Gesnerieae-Ligeriinae), Pheidonocarpa and Bellonia (Gesnerieae-Gesneriinae) are remarkably uniform: ovoid, rostrate with an upturned apex, the two valves opening only slightly, and only splitting the superior portion of the ovary; the insides of the valves with a row of stiff trichomes, releasing the seeds like a salt shaker. The capsules of Lembocarpus, Rhoogeton and Cremersia are quite different: here the two short valves open to 180°, the valves being pushed apart by pads of swelling tissue situated at the base of the valves. 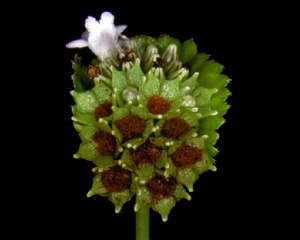 Horizontal, follicular fruits occur in particular species of Diastema, Monopyle, Gloxinella lindeniana and Kohleria amabilis, suggesting dispersal by rain. An example of a bowl-shaped rain-splash cup is Gesneria humilis. Irregular capsule dehiscence has been reported for Cremosperma, Cremospermopsis and Tylopsacas. The mode of capsule dehiscence is rather independent of ovary position. In fruits resulting from (semi-) inferior ovaries either the apical, free ovary parts open or the inferior parts split into halves or on one (the upper) side (Gloxinella, Monopyle spp.). fleshy capsules in which the valves curve back and become separated from the placentae; the latter forming a central cone covered by the glistening mass of funicles and seeds (e.g., Alloplectus, Drymonia and Nematanthus). Peculiar are the fruits of Solenophora calycosa: the fleshy capsules (resulting from an inferior ovary crowned by a persistent calyx) split in an irregular manner, exposing a central red globe of placentae and seeds. Two Drymonia display fruits — D. serrulata (l) and D. conchocalyx (r). Fruits remaining closed at seed maturity are common in the Gesnerioid and Coronantheroid Gesneriaceae (Gesnerioideae-Beslerieae/Gesnerieae/Coronanthereae. True (fleshy) berries, either white or coloured and of variable shape (globose, ovoid, depressed, etc.) are found in Columnea, Corytoplectus, Rufodorsia, Neomortonia, Codonanthe, Drymonia p.p., Besleria, Asteranthera, Sarmienta and Mitraria. Significant differences can be found in the nature of the pulp: in the episcioid genera (Gesnerieae-Columneinae) it consists of plump and swollen funicular tissue, in Besleria (Gesnerieae-Beslerieae) of enlarged placental tissue. In a few Besleria species from Costa Rica, Panama, Venezuela and French Guiana the berries peel and the bright coloured, paper-thin pericarp becomes reflexed or coiled above the hanging remainder of the fruit, which consists of attractively coloured placental tissue and seeds (for details of Besleria macropoda and similar species see Berger et al. 2015). Columnea orientandina (l) and Codonanthe gracilis (r) are from quite different genera, but have a similar fruiting habit. In the paleotropical Gesneriaceae indehiscent fruits are found only in two or three genera: Cyrtandra, Sepikea (if regarded as distinct from Cyrtandra) and Rhynchotechum. By far the largest genus is Cyrtandra with ovoid or somewhat elongate and often very hard (sclerocarpous) fruits. It is still unknown how these fruits are dispersed. More typical (fleshy) berries are found in the Pacific (e.g., Hawaiian) species of Cyrtandra. These are eaten with some probability by birds. 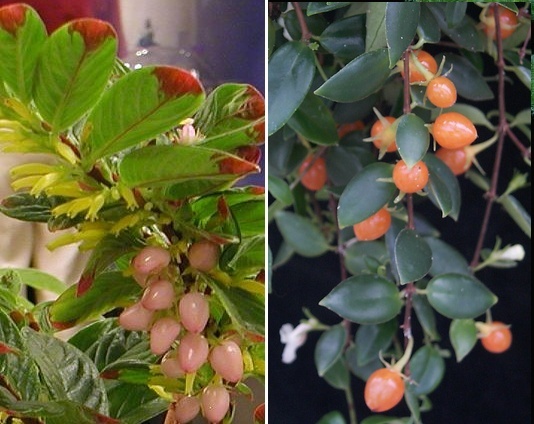 Cyrtandra pogonantha (l) is a Pacific species and has soft berries; C. patula (r) is a Malaysian species, and has sclerocarpous (= very hard) fruit. The fruits of each are typical for their geographic location. Ovules and seeds are generally produced in great numbers. The seeds are always small, usually less than 1 mm long and 0.5 mm broad. Shape is variable, to some degree even within a single capsule. The ellipsoidal form dominates, less common are globose or spindle-shaped seeds. The seeds of the neotropical Gesneriaceae tend to be larger, as they have generally a larger amount of endosperm (nutritive tissue). The largest seeds are found in Codonanthe (c. 3mm). In the species living as ants’ nest epiphytes the capsules contain only c. 35 seeds. 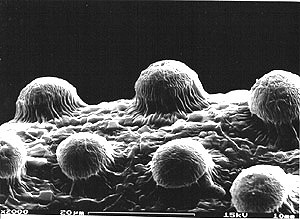 Seed coat structure (surface sculpture) was surveyed in the family by means of SEM by Beaufort-Murphy (1983). In the Coronantheroid, Gesnerioid and Epithematoid Gesneriaceae (Gesnerioideae-Coronanthereae, G.-Beslerieae, G.-Napeantheae and G.-Gesnerieae, Didymocarpoideae-Epithemateae) the seed coat structure is simple. The contiguous cell walls are thickened, but there are no sculptural elements on the surface of the testa cells. Distinct ornamentation of testa cell surface seems to be restricted to the Didymocarpoid Gesneriaceae (Didymocarpoideae). A “verruculate” testa is characteristic of most African species (Schizoboea, Hovanella, Saintpaulia, Linnaeopsis, Streptocarpus subg. Streptocarpella): each testa cell produces a dome-shaped elevation in the centre. Aeschynanthus evrardii has long straight pods, which split open to reveal many seeds with long hairs attached at both ends. The hairs facilitate wind dispersal of the seeds. Distinct seed appendages in the form of triangular or (more commonly) long filiform structures are produced in Aeschynanthus and Agalmyla. The apical end of the seed always bears a single appendage that arises from an elongation of the ovule tip. A first step in the formation of a seed appendage may be seen in the apically pointed seeds of Anna. A consecutive step is the rather short, triangular appendage of Aeschynanthus sect. Microtrichium. In the other sections of Aeschynanthus the apical appendage is hair-like, sometimes reaching a length of 4–5 cm. The hilar end of the seed may bear a single hair as well. This corresponds to the funicle in Lysionotus, but represents a separate outgrowth in Agalmyla and Aeschynanthus. In the latter genus there are also species with two, several or many hairs at the hilar end of the seed (Aeschynanthus sect. Polytrichium). The number of hairs has been used already by Bentham (1876) for distinguishing sections in Aeschynanthus. Recent studies are by Mendum et al. (2001) and by Christie & Mendum (2001). Dispersal of appendaged seeds is obviously by wind. A slight current of air is sufficient to blow the seeds away. In these epiphytic plants the hairs (especially when wet) may also help to attach the seeds to the bark of branches or tree trunks. In the species with a coma of hairs, the hairs spread in dry weather and form a parachute. The great effectiveness of a hair coma in wind dispersal explains the wide distribution of Aeschynanthus sect. Polytrichium in Asia and Malesia. The enlarged fleshy white funicles of the neotropical Chrysothemis friedrichsthaliana are rich in fatty oil and serve as a kind of elaiosome in ant dispersal. Also the seeds of Codonanthe bear a many-celled hyaline and long funicle. In this genus the unusually large (ca. 3 mm long) seeds are clad by an aril-like cupule in the lower half. Some Codonanthe species are typical ant-garden plants and seed transport by ants has actually been observed. Ants are frequently secondary dispersers of seeds, when the originally closed fruit is broken up. An example is Rufodorsia minor: after the berries are broken open, which is generally accomplished by birds, the seeds are carried away by ants. A variety of display fruits are present in the Gesneriaceae, which facilitate recognition by feeding animals and subsequent dispersal of the seed. These include both berries, which can be presented by dramatic calyx displays, and (usually semi-fleshy or fleshy) capsules with colorful display of the seed mass.